GetMoreOnlineReviews.com provides an easy and unobtrusive way to ask and remind customers to review your business on the sites that matter to you. We call it a "review funnel". 1. Systematically drive customers to one conversion funnel that routes them to the review sites you care about. 2. Increase review volume and quality by automatically asking, reminding and guiding happy customers through the process of completing a review. 3. Get a second chance with unhappy customers by guiding them to a service recovery. 4. 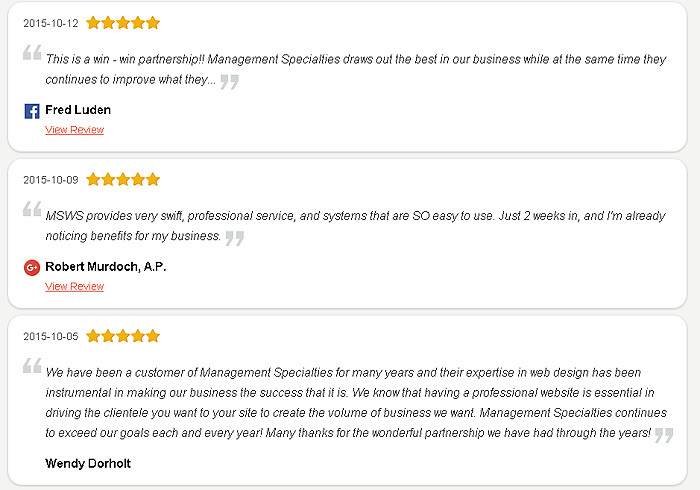 Leverage and amplify 4 & 5 star reviews by automatically streaming them to your website. GetMoreOnlineReviews.com overcomes these two obstacles by making the review process frictionless. Your “review funnel” solves those problem - we focus your customer on one task and one task alone: completing their review. We help them identify the optimal site for you and them (such as a site that lets them login through Facebook without creating a new account) and give them just enough education on how to do it, dramatically increasing their chances of completing the task. Can’t I Just Buy Reviews? According to Gartner, by 2014, 10 to 15 percent of all online reviews will be fake or paid for by companies. (Gartner, 2012) DANGER: Do not buy reviews. Let me repeat, do not buy reviews. Besides being dishonest and possibly fraudulent and illegal, faking or buying reviews is a bad idea for your business. Many review sites actively punish such behavior. In the long run, ill-begotten reviews will lead to consumer distrust of your company, public shaming by review sites, and irreparable harm to your business. It’s not worth it. How do I get started & how much does it cost? It’s very ffordable and easy. Click here for prices and sign up info!